Barcode Warehouse only carries the best wax/resin ribbons for use in Zebra TLP 2824/2722/2622 desktop printers that utilize a 1/2" core and 244’ ribbon. With reliable, sharp-edge print quality capabilities, our wax/resin ribbons offer excellent barcode scanning, extreme versatility and superior smudge and chemical resistance. 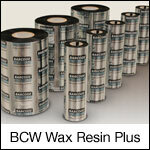 The BCW Wax/Resin Plus Ribbon provides superior smudge and scratch resistance on paper and synthetic label stocks. Product 4150160 is 2.25" x 244' on a 0.5" core and has 12 rolls per case.